The shuttle deposited us in a sea of deep white snow. Just me, Susan and our snowshoes, and a big sign marking the entrance to the Superior Hiking Trail adjacent to Sugarloaf Road. “It’s well marked,” the driver told us. But once in the woods, the trail was just a vague indentation in the snow. She promised us we’d need our snowshoes, as opposed to the other trails near the highway. “Those are so well used, you can walk them in your boots.” We went for virgin territory, and we got it. Ahead, tall tree trunks cast long shadows, crisscrossing the soft white snow. Baby pines, the next generation of towering trees, added green décor complimenting the deep blue of the sky beyond. The enticing scene beckoned. 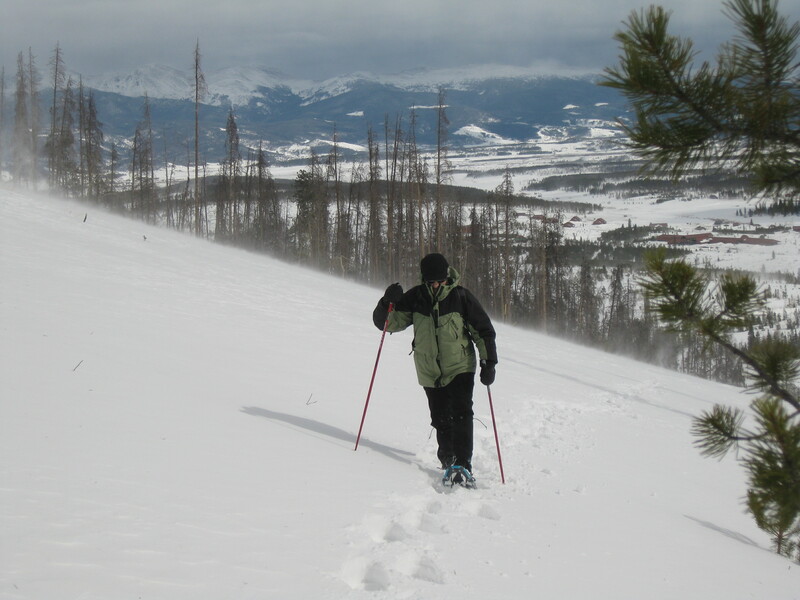 This was a cross-country ski trip, but we had abandoned our skis for the day. The day before, the cold temperatures and chilling wind tested our mettle skiing the frosty trails, speed whipping away our meager warmth faster than we could generate it. So we decided on a day tromping through the woods instead. We didn’t have to go far before we had tracks to follow. Animal tracks. Plenty of deer scampered around. Rabbits left their signature imprint. Some tiny critter stamped out a precise symmetrical trail, a perfect wintry zipper. But it was the wolf imprints that held our gaze. Impossibly large, they forged ahead on the trail. Other padded feet came and went, but these tracks stayed with us for the duration of our hike. I hoped our canine companion knew how to read the blue blazes to keep us on the right trail. High in the sky, the bright sun delivered warmth whenever it reached us. In the dark shadows of the trees, the temperature plummeted. 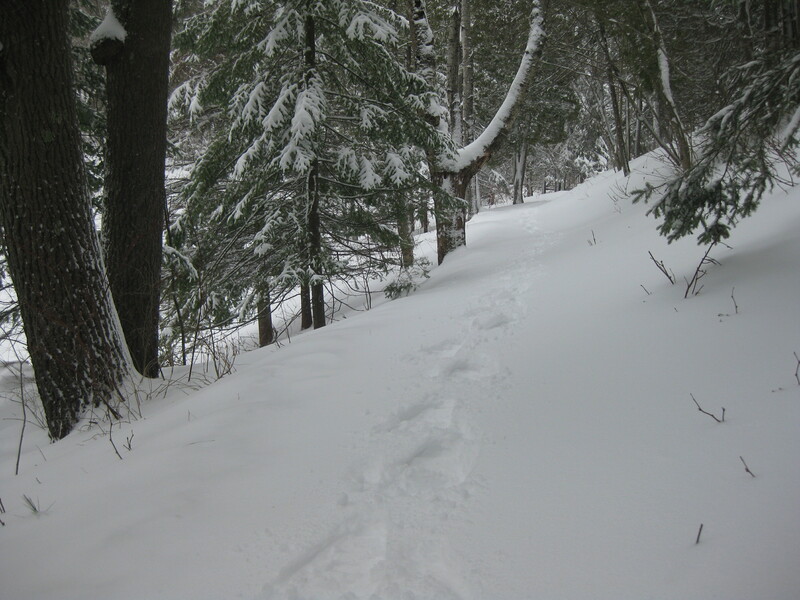 The deep silence of the woods was broken only by the plunge and shuffle of our snowshoes. Gasps of delight, and “oh this is so beautiful” escaped our lips, confirming the choice we’d made for the day’s activity. Reaching the ridgeline, the trees thinned and we had the promised expansive views of the lake. Traveling high above the shoreline we could see for miles, a full 180° or more. Each creek we crossed had some form of a wooden bridge – a reassuring sign we were still on the trail. Crossing Crystal Creek was the most challenging, scrambling down a deep ravine to reach the covered bridge at the bottom. Climbing back up the other side proved to be easier. 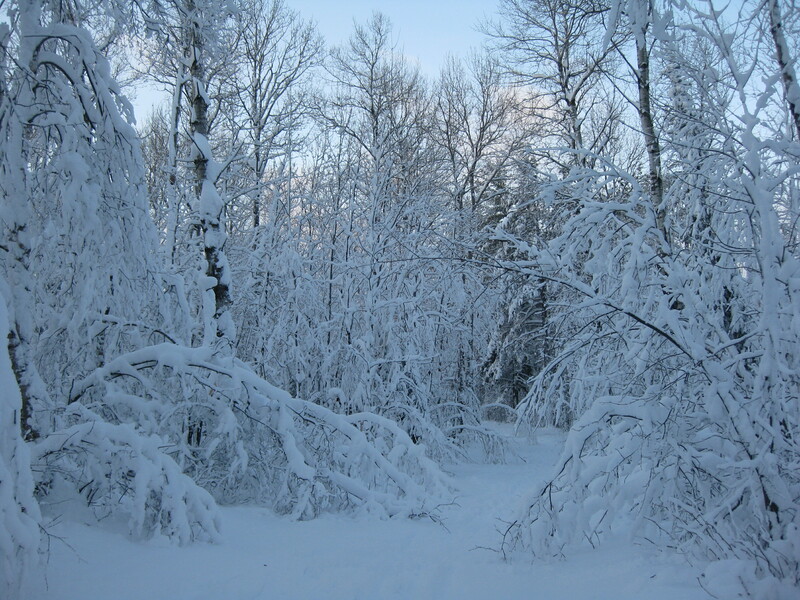 The sudden appearance of numerous snowshoe tracks marked our approach to the Caribou River. The spur route down to the parking lot was impossible to miss. Already missing our wilderness route, we followed the river and admired its icy formations as we returned to our car. I’ve hiked bits and pieces of the Superior Hiking Trail through the years. It’s a treasure that’s easily taken for granted. 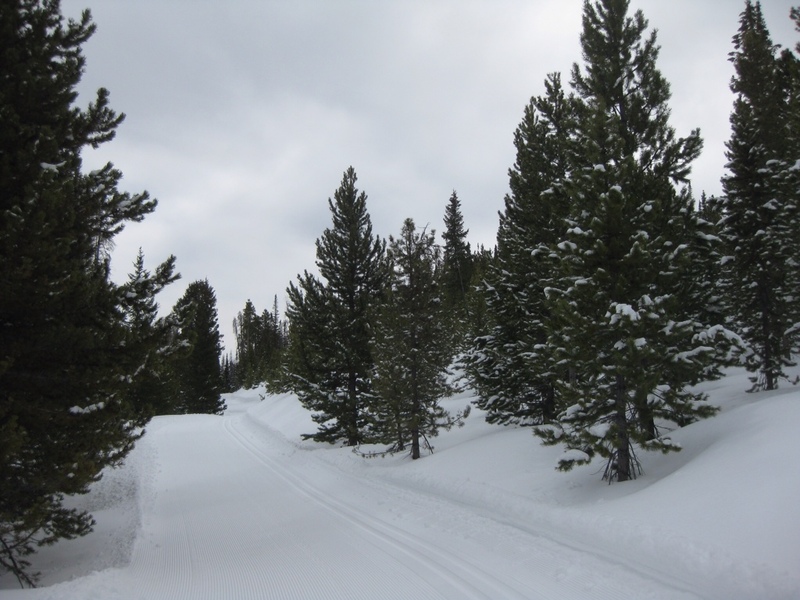 This winter excursion reminded me how the seclusion of the trail works its magic. During that trek the rest of the world fell away. My mind rambled as I paced. I reveled in the nature surrounding me. And I never regretted skipping skiing that day. Neither of us would have gone on our own. And it wouldn’t have been wise. 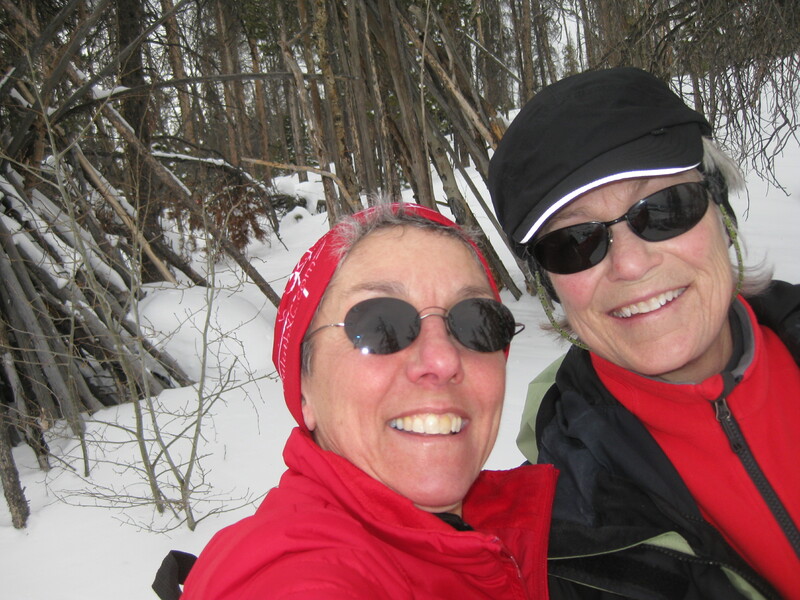 But when my co-worker and I put our heads together at lunch, we prodded each other into going snowshoeing. 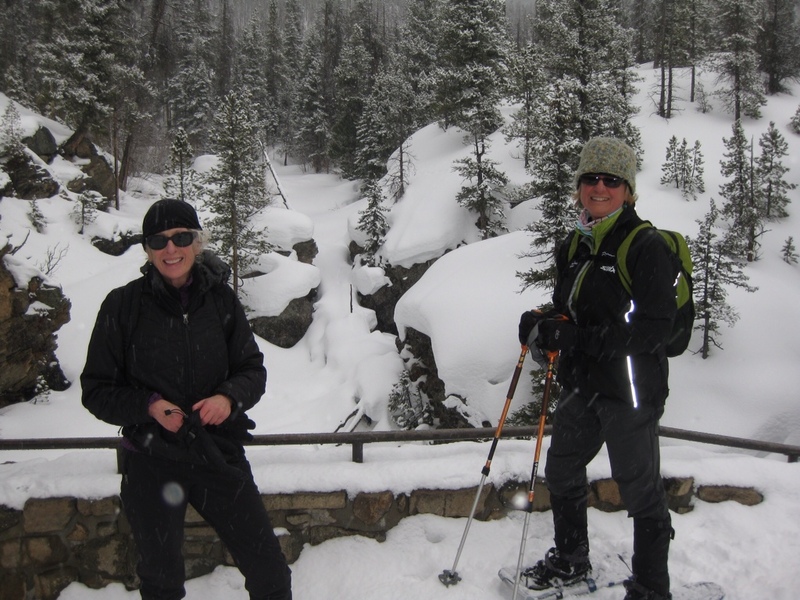 Never mind the wind and blowing snow – we just had to get out and do something. Hoping to escape the open valley, we drove up to higher ground and the starting point of the snowshoe trail up Nine Mile Mountain. The wind was still howling, but we convinced ourselves it was better up there, strapped on our snowshoes and set out. 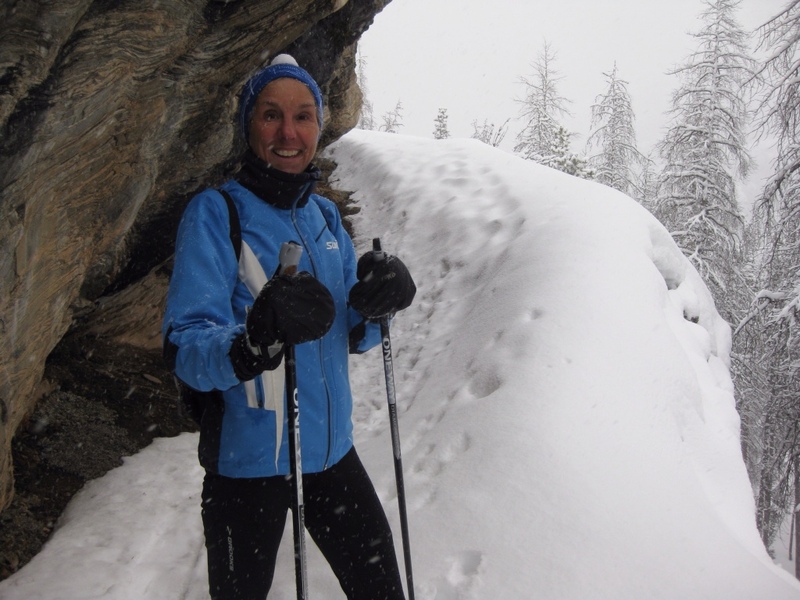 Now many times snowshoe trails are so well traveled that boots are enough, and in fact snowshoes are more of a hindrance than a help. That was not the case for us. 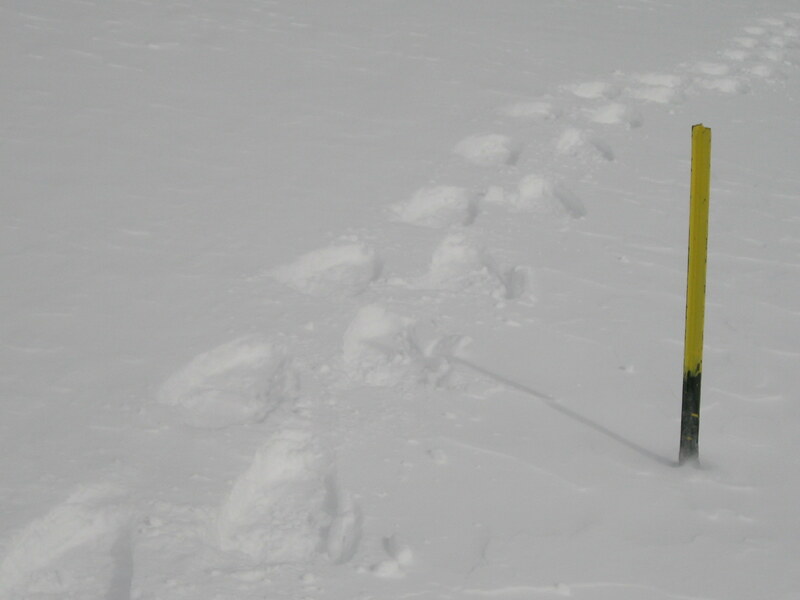 The mountain was covered in deep fresh snow, with no prior evidence of a trail. Fortunately, the route was well marked with tree markers when we went through woodsy bits and yellow posts when we were out in the open. It made me wonder just how tall those posts needed to be to still be showing above the top of the snow. It was a long slog up, but we were glad for the warmth it generated, and stopped frequently to turn and look at the view. It was a gray and white world out there, but beautiful in its own way. And despite the dark clouds, the snow was glaringly white all around us. 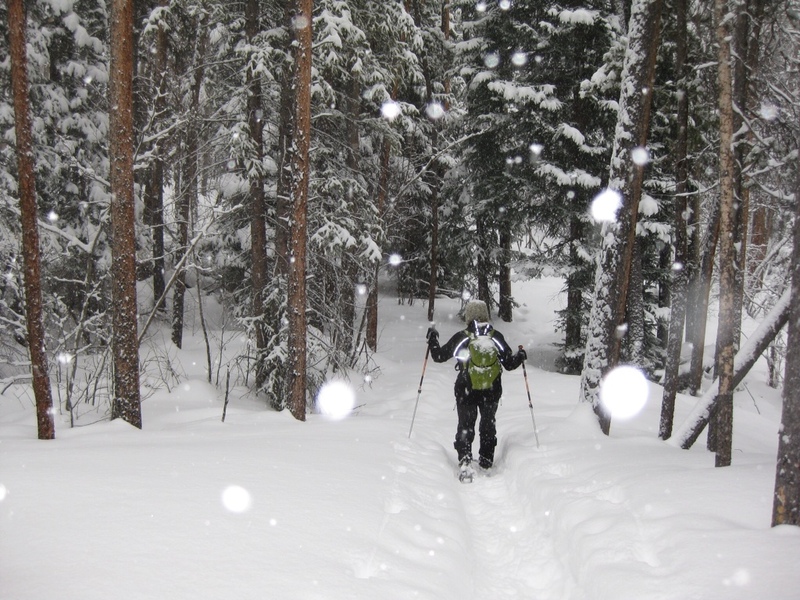 There is something wonderful about snowshoeing. It’s not the same competitive sport that skiing is – at least for me. It’s peaceful and quiet, with plenty of time to reflect. Especially when treading on silent new snow. We each forged ahead at our own pace, carefully keeping each other in sight and reconnecting after short intervals. When we reached the top, there was nothing to tell us we’d made it except the absence of additional trail markers. 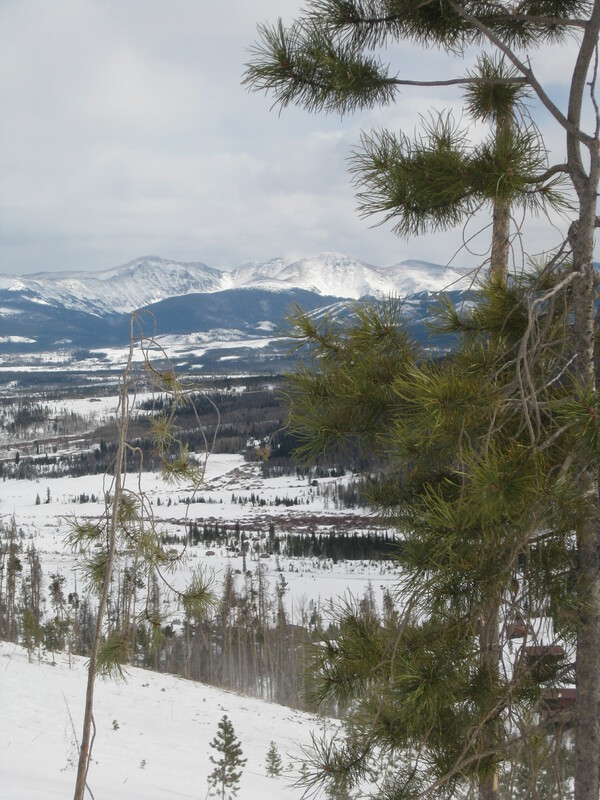 We had a marvelous view of the valley and the whole campus of Snow Mountain Ranch. We could see the Winter Park downhill ski slopes off in the distance. The world was at our feet. We flew back down the mountain in half the time it took us to reach the top. It was easier having a recent trail to follow, but even in the short time since we’d traveled up our footsteps were entirely erased by the wind in spots. We finished with a sense of accomplishment. With the brisk wind still fresh on our faces, we were glad we’d made the effort. Despite the weather, we tackled the mountain. There’s nothing like the holidays to provide ample opportunity to shed our adult persona and reconnect with our inner child. Add to that an abundance of snow, and the possibilities are endless. 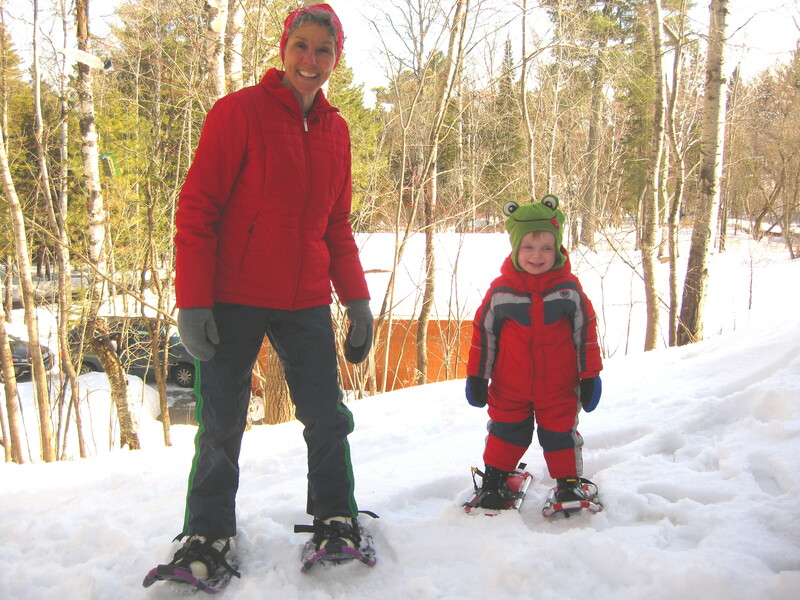 On Christmas day my sons and I headed out on snowshoes to enjoy the deep powdery snow. After averting near disaster when my foot broke through into the flowing Amity Creek, we sought safer ground and stuck to trampling through the woods. With big fat snowflakes falling, it was an idyllic scene. We eventually made our way down to the Big Lake. The snow layer was much thinner there, but Brighton Beach’s rocks were encased in a thick coat of ice, which was beautiful but treacherous for any kind of foot travel. Backing up from the shoreline, we found a cache of rocks under the snow and proceeded to do what any kid would do there – throw rocks in the lake. Since the shoreline was ice-bound, it became a game to see who could break through the ice with a rock, producing a mini spurt of water through the hole. 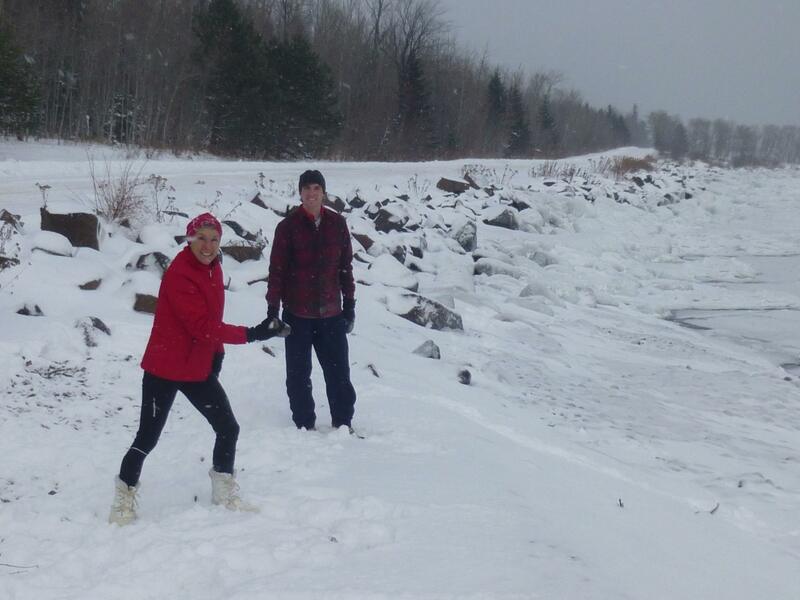 What better way to spend Christmas afternoon, than having a rock throwing contest amid ice and snow? Throw a couple of toddlers into the mix, and the fun multiplies. 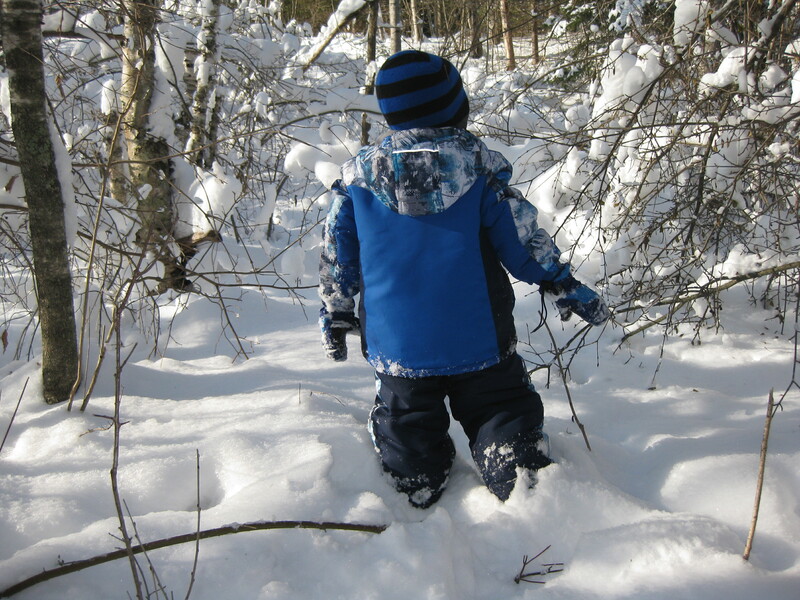 After a morning of sledding on the neighbor’s hill, my grandson proceeded to lead me on a tour of the woods in our yard. Seeing the snow, trees and findings of nature through his active imagination was one of the most delightful hours I have spent in a long time. 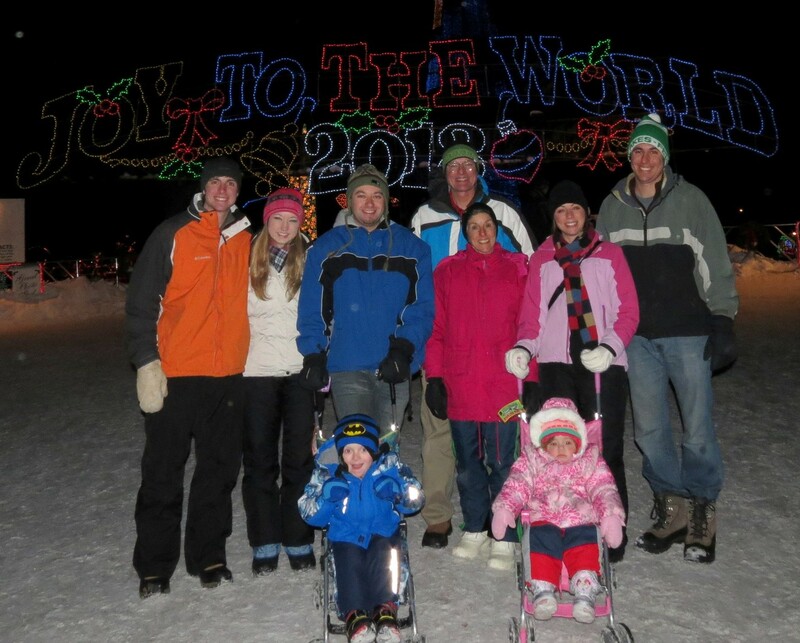 Kids of all sizes love Christmas lights, so a visit to Bentleyville has become an annual tradition. This year the milder temperatures allowed us to linger and enjoy all the offerings of that expansive holiday display. After roasting marshmallows and warming ourselves by the fire, the lively music caught the ears of the littlest ones who began to wiggle and dance. An impromptu family dance party ensued, as we couldn’t resist their merriment and joined in the fun. As family members gradually drift back to their own homes and we resume our own routine after the holidays, I only hope that we can keep some of the kid alive in each of us. It’s far too much fun to reserve for the holidays. I didn’t realize how much I’d missed it. After three days of constant snowfall and heavy cloud cover, the reappearance of the sun lent a welcome glow to the new fallen snow and rays of visual warmth to my world. 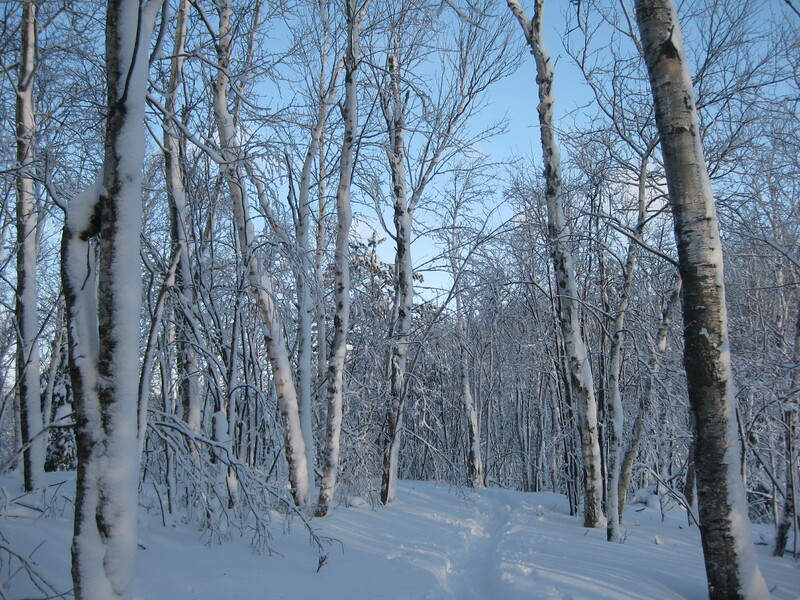 I started snowshoeing in the woods early this morning just past daybreak. The temperature had dropped during the night, and the trees that were doubled over with the weight of the wet snow were now frozen in their curved poses. Occasional trees and branches had snapped and fallen under the strain. Following the trail was like doing an obstacle course. The snow under my feet started out hard and crunchy. While it easily bore my weight, progress was noisy. Further inland, the depth increased and the snow softened. That’s snowshoeing at its best in my mind. Silent and deep. The prettiest trails were those that followed the Lester River. The ground rose high above the water and my path was narrow and secluded. The trees must have been more open to the wind, as they all stood tall and proud. It was at that point that I saw it. The sun had just risen above the clouds at the horizon and illuminated the trees all around me. Their long thin shadows lay across the trail, adding a new dimension to the snow. 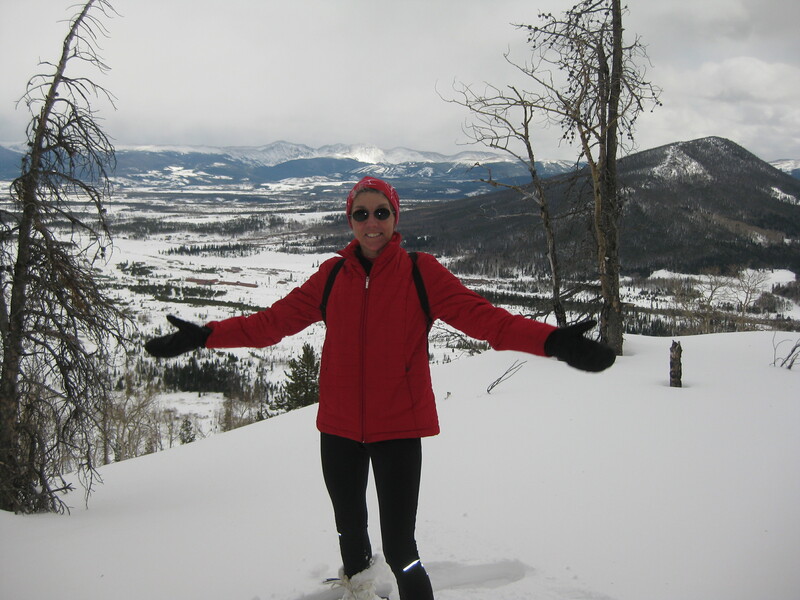 Re-energized by the sun’s appearance, I prolonged my snowshoe trek to absorb my new surroundings. The longer the sun was up, the bluer the sky. 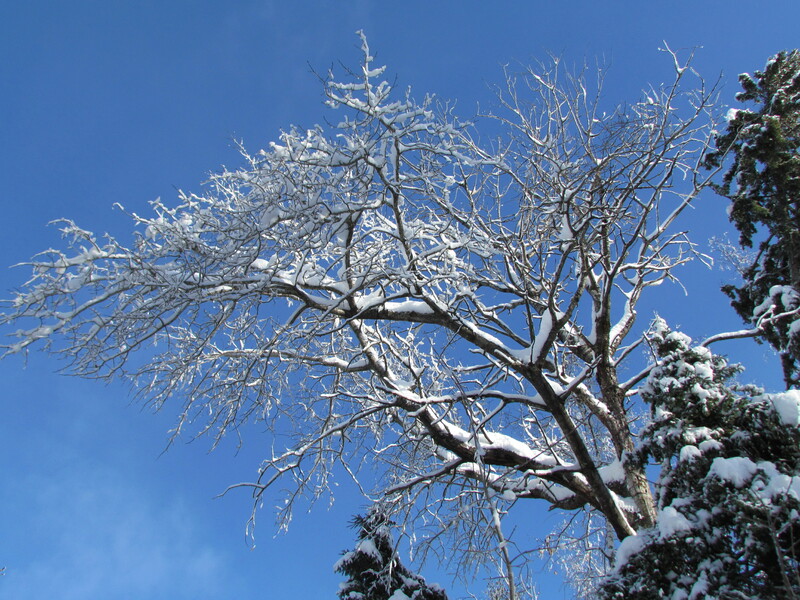 It made a beautiful backdrop for the snow covered tree limbs. And it lifted my spirits. After days of isolation and greyness, we had color again. Ah, sunshine is a wonderful thing. No cherry blossoms here. The only things blooming are the plants on my kitchen island. Including the poinsettia that still retains its brilliant red leaves. Perhaps it’s a sign. Winter has not given up her grip on Minnesota yet. We had such high hopes for spring just a few weeks ago. 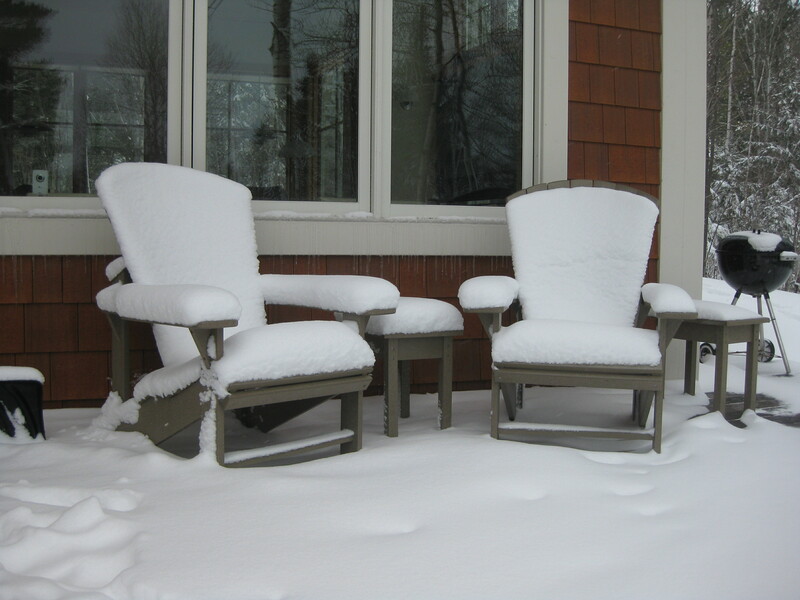 Sitting in the Adirondack chairs on the deck in the sun it was easy to believe in warmth and a thaw. I was sure it was the start of a good trend. We even discussed what wildflowers we wanted to sow in our yard. I won’t be rushing out to buy seeds any time soon. Amity Creek broke through its icy prison a little while back. We welcomed the return of the water’s roar as it flowed over the rocks with renewed gusto – white noise that we enjoy hearing from our open windows. 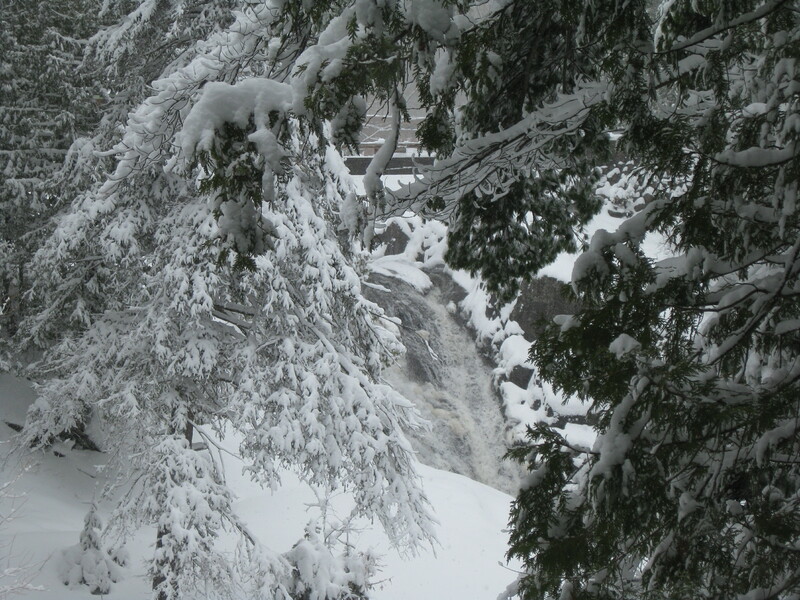 Today I could barely distinguish the waterfall at The Deeps through the frosty trees in the foreground. Minnesota has its own unique flavor of spring. Just this once, I wouldn’t mind being a bit more mainstream. If you’ve read anything on my blog, you’ve figured out that I love the outdoors. And winter. So I’ve been eager for my grandkids to reach an age when they too can come out and share some outdoor activities with me. Who would have guessed that in late March we’d have better snow than the previous two Christmases? Finally, I had my opportunity. With a yard full of deep snow, mild temperatures and the grandkids visiting for the weekend, I laid my plans. 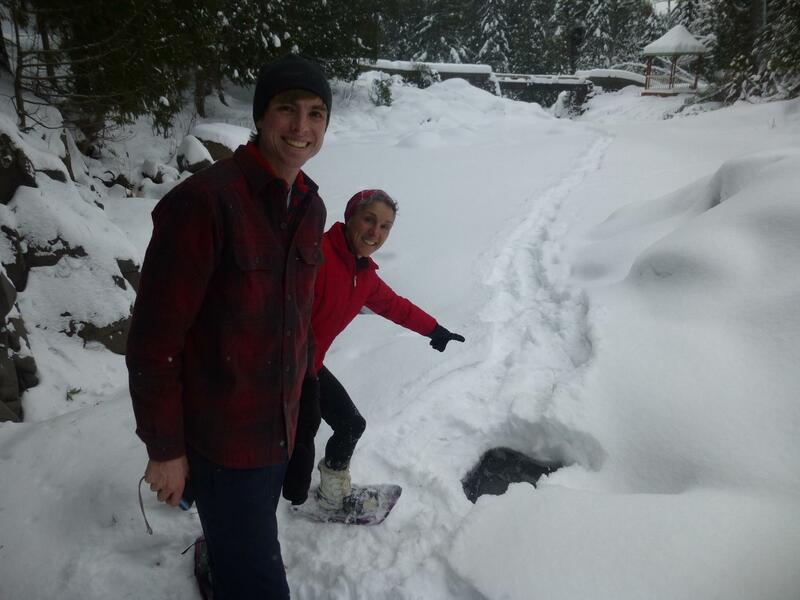 Friends lent me some mini snowshoes, and I couldn’t wait to try them out with Ben. He thought they were pretty cool when we strapped them on. And standing on top of the snow with them he was all grins. Walking, however, turned out to be another matter. 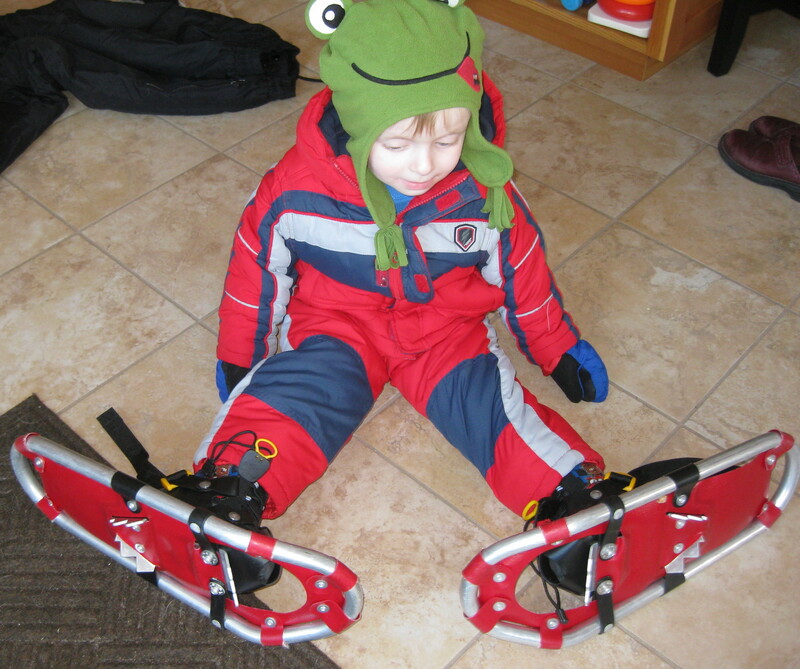 Ben’s snowshoes kept trampling on each other. How to explain to a toddler that he has to walk with his legs spread far apart? Clearly I wasn’t quite getting my point across. Not wanting to put him off, we scratched that mission for the time being. We’ll give it another try later. On to the sliding hill! 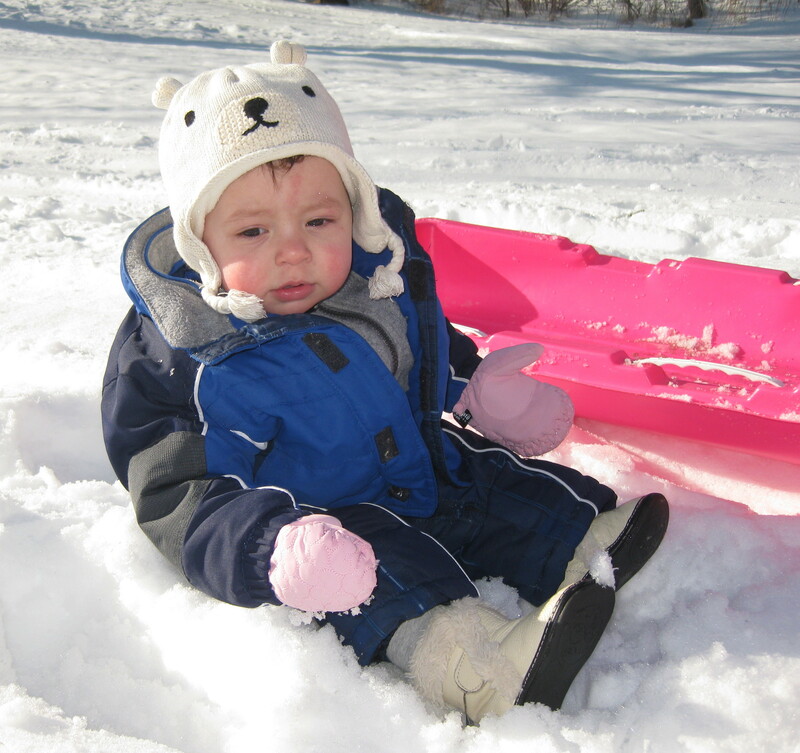 By this time Mya was bundled into her snowsuit. At a year old she’s already more adventurous than her cautious brother. She rather enjoyed her plunge down the hill with her dad. Ben and I followed, but it turns out my sled driving was a bit wild – fast, wobbly and snow in the face were not Ben’s idea of a good time. 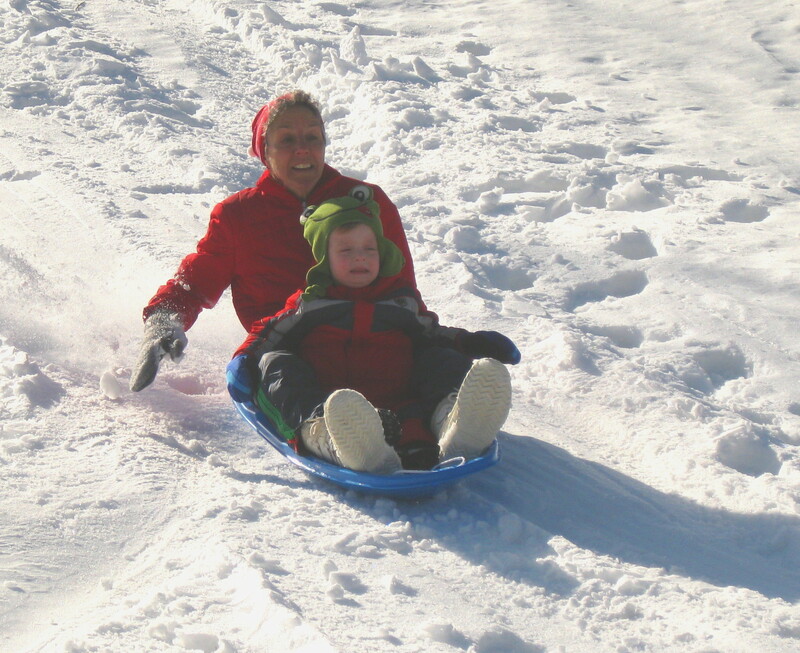 Fortunately, his daddy was able to navigate a more sedate ride down the hill, and Ben never noticed that each successive trip down got faster and longer. I guess I need to tone down my enthusiasm a bit to better match the tastes of a toddler. I haven’t given up yet. But I guess I’d better hold off getting those kiddie cross-country skies for a while.